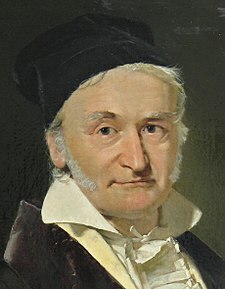 Hi Johann Carl Friedrich Gauss (30 Abril 1777 – 23 Pebrero 1855) usa nga Aleman nga matematiko ngan syentipiko nga dako an naibulig ha lain-lain nga butang sugad han teorya han ihap, estadistika, analisis, heyometriya diferensyal, heodisya, elektrostatika, astronomiya, ngan optika. 1801: Disquisitiones Arithmeticae. Hinubad ha Inaleman ni H. Maser Untersuchungen über höhere Arithmetik (Disquisitiones Arithmeticae & other papers on number theory) (Ikaduha nga edisyon). New York: Chelsea. 1965. ISBN 0-8284-0191-8 , pp. 1–453. Hinubad ha Iningles ni Arthur A. Clarke Disquisitiones Arithemeticae (Ikaduha, ginliwat nga edisyon). New York: Springer. 1986. ISBN 0-387-96254-9 . 1809: Theoria Motus Corporum Coelestium in sectionibus conicis solem ambientium (Theorie der Bewegung der Himmelskörper, die die Sonne in Kegelschnitten umkreisen), Hinubad ha Iningles ni C. H. Davis, reprinted 1963, Dover, New York. 1821, 1823 und 1826: Theoria combinationis observationum erroribus minimis obnoxiae. Drei Abhandlungen betreffend die Wahrscheinlichkeitsrechnung als Grundlage des Gauß'schen Fehlerfortpflanzungsgesetzes. (Three essays concerning the calculation of probabilities as the basis of the Gaussian law of error propagation) Hinubad ha Iningles ni G. W. Stewart, 1987, Society for Industrial Mathematics. 1827: Disquisitiones generales circa superficies curvas, Commentationes Societatis Regiae Scientiarum Gottingesis Recentiores. Volume VI, pp. 99–146. "General Investigations of Curved Surfaces" (published 1965) Raven Press, New York, translated by A.M.Hiltebeitel and J.C.Morehead. Bühler, Walter Kaufmann (1987). Gauss: A Biographical Study. Springer-Verlag. ISBN 0-387-10662-6. Dunnington, G. Waldo. (2003). Carl Friedrich Gauss: Titan of Science. The Mathematical Association of America. ISBN 0-88385-547-X. OCLC 53933110. Gauss, Carl Friedrich (1965). Disquisitiones Arithmeticae. tr. Arthur A. Clarke. Yale University Press. ISBN 0-300-09473-6. Hall, Tord (1970). Carl Friedrich Gauss: A Biography. Cambridge, MA: MIT Press. ISBN 0-262-08040-0. OCLC 185662235. Kehlmann, Daniel (2005). Die Vermessung der Welt. Rowohlt. ISBN 3-498-03528-2. OCLC 144590801. Sartorius von Waltershausen, Wolfgang (1966). Gauss: A Memorial. Tent, Margaret (2006). The Prince of Mathematics: Carl Friedrich Gauss. A K Peters. ISBN 1-56881-455-0. O'Connor, John J.; Robertson, Edmund F., "Carl Friedrich Gauss", MacTutor History of Mathematics archive, University of St Andrews, http://www-history.mcs.st-andrews.ac.uk/Biographies/Gauss.html. Grimes, James. "5050 And a Gauss Trick". Numberphile. Brady Haran. Ini nga pakli kataposan nga ginliwat dida han 07:55, 27 Enero 2015.